After a poor showing in South Carolina, coming in fourth place with just 46% reporting, former Florida Governor Jeb Bush has ended his dismal presidential bid. He also congratulated his former rivals who still remains in the race. “I congratulate my competitors that are remaining on the island, on their success for a race that has been hard-fought,” Jeb said with Senator Lindsey Graham standing by his side. In Iowa, Jeb finished sixth, only winning 2 percent of the caucus vote even despite outspending his rivals who far did out better than he did. Following the Iowa caucus, Jeb came fourth in New Hampshire, only in pure luck, defeating Rubio, who came in fifth due to his disastrous debate performance. South Carolina was do or die for Jeb as it is viewed as the first in the south primary state that makes or breaks a campaign going forward. “In this campaign, I have stood my ground, refusing to bend to the political winds,” Bush said. The one time favorite for the Republican nomination was hoping for a strong showing in South Carolina. It was the same state where his father and brother once won the primary that paved their way to entering the White House. Bush brought his brother, former President George W. Bush onto the campaign trail earlier this week to help boost his fortunes in the Palmetto State, but it did little to nothing to help him. A huge blow to his campaign hopes for a strong finish on Saturday night was the South Carolina Governor endorsed Marco Rubio. Being a popular name amongst South Carolina, Jeb was courting heavily for Haley endorsement with his brother also working to help secure her nod. At the end, it failed as Haley “disappointed” Jeb to endorse his toughest competition for the establishment lane. Haley’s backing of Rubio was a significant development that helped the Florida Senator win second place over Ted Cruz. 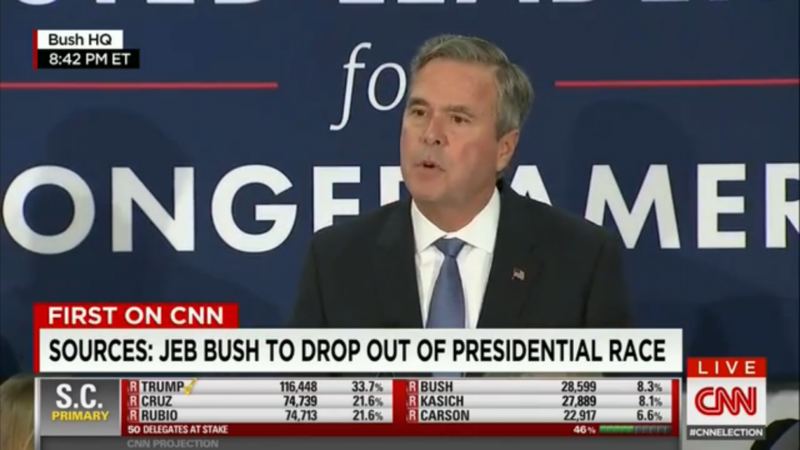 Entering the race with a massive campaign war chest even before announcing his bid in June of last year along with a solid organization in 43 out of 50 states, and top name campaign consultants, it was suppose to be a solid campaign strategy to help Jeb secure the republican nomination. But despite all this, Bush wasn’t able to garnish the popular support needed to show his donors the investment was worth it all. The former Florida governor struggled to distance himself from his family’s last name and family by campaigning without the last name attached to his slogan and as his own. A poor showing in Iowa led to Jeb bringing his mother out on the campaign trail in New Hampshire and his brother in South Carolina. Even without his family on his side, Jeb throughout the campaign trail appeared nervous and uncomfortable and his weak debate performance led to Trump coining the term “low energy,” a term Trump has repeatedly used against Jeb. So far only two out of the five candidates still in the 2016 race have taken to social media to praise Bush. Ohio Governor John Kasich and Texas Senator Ted Cruz, with one candidate most likely to benefit with Bush’s departure with the other hoping to attract his support.